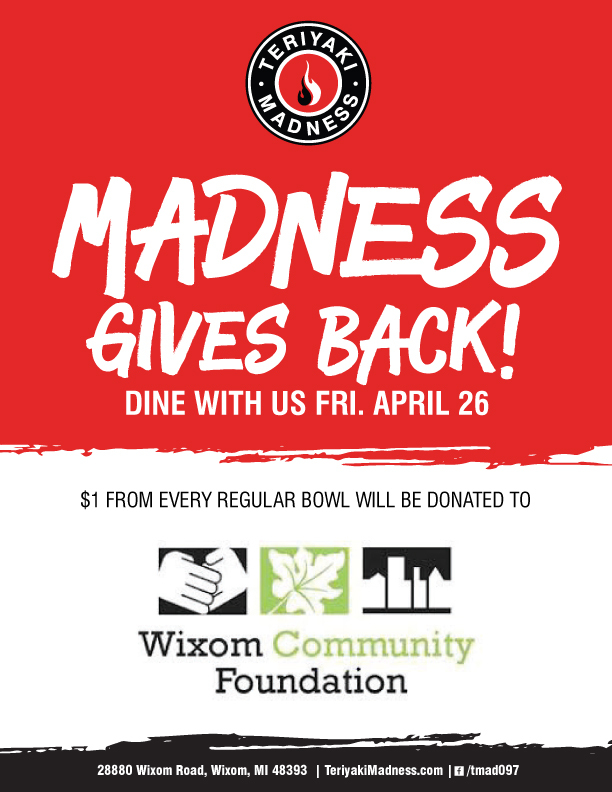 Teriyaki Madness is donating $1 for each bowl of food sold at their grand opening on Friday, April 26th to the Wixom Community Foundation. Please support this event! Congratulations to the winners of 2018 Wixom Community Foundation scholarships! 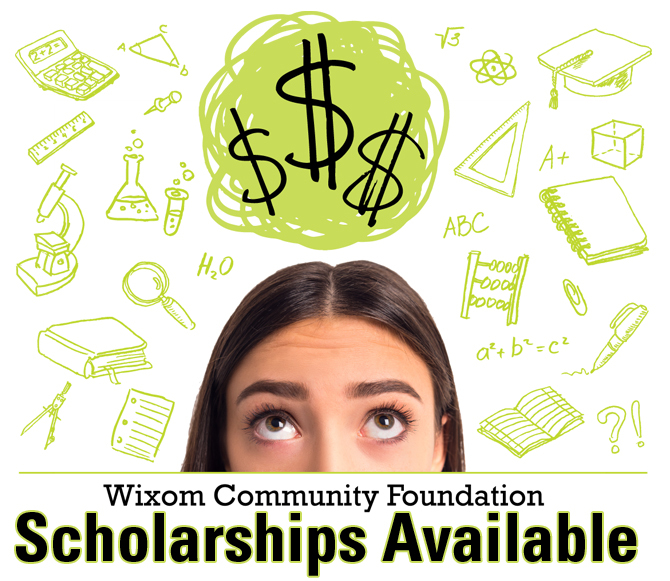 The WCF will be presenting the students with their scholarships on Thursday, July 19th at Sibley Square in downtown Wixom during Wixom’s Hot Blues & BBQ event. The winners of the 2017 Wixom Community Foundation (WCF) scholarships received their awards during Wixom’s Hot Blues & BBQ on Thursday, July 20th. WCF Scholarship Chairman and Wixom resident, Josh Springer introduced the students and their presenters. Total Sports Project Manager Mike Moscone presented to Lauren Shay Ahern of Farmington Hills and John Tracy of Commerce. Applicants are asked to provide real life examples of how a “Team” was used to teach life skills and how being a team has impacted their personal lives. Two winners are chosen for this award, one male and one female. WCF Chairman, Wixom resident and Wixom City Councilman, Nick Kennedy presented to Mark Foster of Wixom. Wixom resident and Wixom City Councilman and WCF Board member, Robert Smiley presented to Utsav Lathia of Wixom. Applicants should be entering in the science, technology, engineering, mathematics or environment based areas of study and must include career goals as part of their application. Wixom resident and Wixom City Councilman, Tom Rzeznik presented to Mark Foster of Wixom. Applicants are asked to reflect on a time when they challenged a belief or idea. What prompted them to act and if they would make the same decision again. WCF Executive Director Rene Saenz presented to Shayna Roble of Novi. Applicants were asked to outline their academic/career goals and how this scholarship would help to achieve those goals. 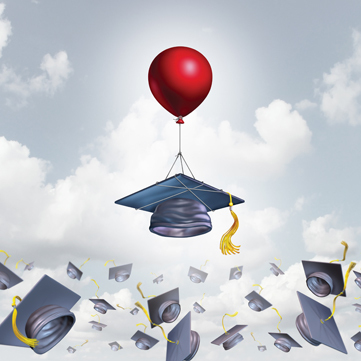 Historically, the winner of the scholarship is entering the education field such as teachers, educators, principals and other educational leaders. The WCF is looking to add new scholarship sponsors within the community, as well as members who want to make a positive impact on the community by building relationships with both businesses and residents. The Wixom Community Foundation would like to thank the scholarship donors – thank you! The WCF is proud of these great young people and looks forward to following their college careers. We will be checking in on them from time-to-time and letting you know how they are doing, so check back with us! Congratulations to the winners of 2017 Wixom Community Foundation scholarships! Watch the entire presentation (about 6 minutes long) by clicking here. For more information on the winners, click here. For more information on the WCF scholarships, click here. Congratulations to the winners of 2017 Wixom Community Foundation scholarships! The WCF will be presenting the students with their scholarships on Thursday, July 20th at Wixom’s Hot Blues & BBQ (6-10pm). The traveling exhibition entitled “Forbidden Art” created by concentration camp prisoners while imprisoned by the Nazis during World War II has opened in the City of Wixom’s library. The reception featured guest speaker Teresa Wontor-Cichy, an historian at the Research Center of the Auschwitz-Birkenau State Museum of Poland. The opening reception to welcome this extraordinary exhibit was March 19 at the Wixom Community Center. The reception featured guest speaker Teresa Wontor-Cichy, an historian at the Research Center of the Auschwitz-Birkenau State Museum of Poland. She is the author of several historical publications, including Imprisoned for Their Faith: Jehovah’s Witnesses in KL Auschwitz and Clergy and Religious Practices in Auschwitz. Ms. Wontor-Cichy completed several seminars, workshops and programs, among them the Seminar in Holocaust Studies in Yad Vashem (2005, 2008), and “Memorial Sites as a Key for Future Education” organized by the Secretariat of the International Commission for the Evaluation of the Crimes of the Nazi and the Soviet Occupation Regimes in Lithuania (2012). She is the historical consultant for many documentary films about Auschwitz history, earning her a page on IMDb.com. She is a noted lecturer on several aspects of Auschwitz camp history including different Auschwitz prisoners groups, the SS garrison, medical crime, evacuation and liberation of the camp. Ms. Wontor-Cichy received her master’s degree from Catholic University in Lublin, Faculty of Humanities, Institute of History. Guests also enjoyed the music of celebrity violinist Sonia Lee. Ms. Lee has performed with the Three Tenors, Joni Mitchell, Billy Joel, Rod Stewart, Diana Ross, Paul McCartney, the Toronto Symphony, the Buffalo Philharmonic Orchestra and many more. Ms. Lee has performed for CNN’s Larry King and was featured in the first season of the television show America’s Got Talent. 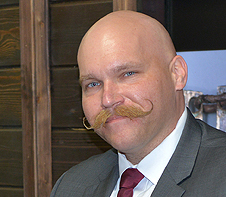 JJ Przewozniak, Curator of Collections for The Polish Mission of the Orchard Lake Schools. Forbidden Art will be at the Wixom Public Library from March 20 through April 6, 2017. The exhibit is made possible by the Wixom Downtown Development Authority, the Wixom Community Foundation, and local sponsors. The exhibit was developed and is presented in North America by The Polish Mission of the Orchard Lake Schools in exclusive partnership with the Auschwitz-Birkenau Museum. It has been displayed at prominent institutions such as the Dwight D. Eisenhower Presidential Library, West Point, the Hoover Museum, and UCLA. The City of Wixom exhibit is funded in part through a grant provided by the Michigan Council for Arts & Cultural Affairs and the Anton Art Center. Watch this video for a sense of what you will experience at the Forbidden Art Exhibit: March 20 – April 6, 2017 in the Wixom Library. 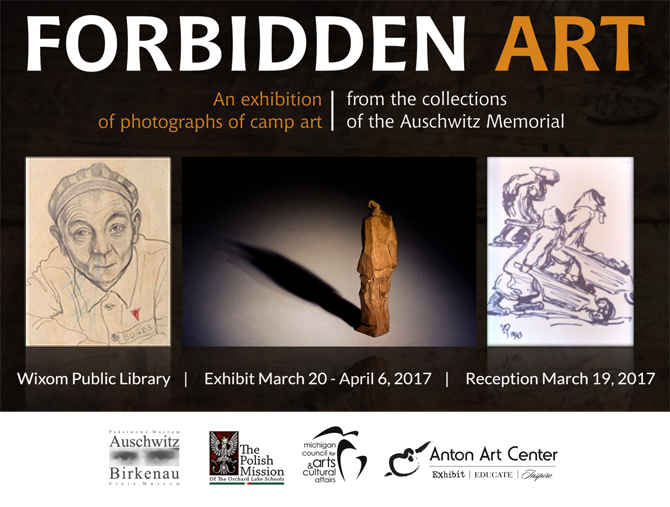 The City of Wixom is proud to announce that they will host the traveling exhibition entitled Forbidden Art, a collection of images of artwork created by concentration camp prisoners while imprisoned by the Nazis during World War II. The exhibition originated at Poland’s Auschwitz-Birkenau State Museum (A-B Museum) and is made up of twenty large color photos of drawings and sculptures made by inmates of the Auschwitz, Buchenwald, and Ravensbrüeck concentration camps. Each of the photographs is accompanied by a historical commentary and a narrative account as to why the piece was created. The original objects are permanently housed at the A-B Museum and are far too delicate for public display. Forbidden Art will be installed at the Wixom Public Library from March 20 through April 6, 2017. The exhibit is made possible by the Wixom Downtown Development Authority, the Wixom Community Foundation, and local sponsors. The exhibit was developed and is presented in North America by The Polish Mission of the Orchard Lake Schools in exclusive partnership with the Auschwitz-Birkenau Museum. It has been displayed at prominent institutions such as the Dwight D. Eisenhower Presidential Library, West Point, the Hoover Museum, and UCLA. The City of Wixom exhibit is funded in part through a grant provided by the Michigan Council for Arts & Cultural Affairs and the Anton Art Center. Please join us for an opening reception to welcome this extraordinary exhibit. This evening’s almost-black-tie reception is sponsored by the Wixom Downtown Development Authority, the Wixom Community Foundation, and local Wixom businesses. We will be honored by the presence of a speaker from Poland’s famed Auschwitz-Birkenau State Museum who will provide intimate details of this moving artwork. The reception includes refreshments and hors d’oeuvres, music, and exhibit viewing. To purchase tickets, please see the City website’s Activities & Events Registration Page or call 248-624-2850. Throughout most of U.S. history, American high school students were routinely taught vocational and job-ready skills along with the three Rs: reading, writing and arithmetic. Indeed readers of a certain age are likely to have fond memories of … read more.